Home Ferrets Can Ferrets Eat Cat Food? And if they can eat cat food, what cat food can ferrets eat? We all want to feed our pets the best food for them and keep them healthy. However, for less popular pets like ferrets, pet stores don’t always carry the right food. And the employees don’t always know the best ways to take care of them. That’s why you often find people feeding ferrets cat food. 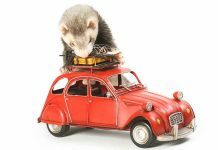 To really know whether cat food is sufficient for your ferret, you need to understand a ferret’s diet and what they need to not only survive, but to prosper. Are ferrets like cats, when it comes to nutrition? To start, you need to know that ferrets are carnivores, much like cats. They only eat meat, and nutritionally balanced ferret pellets are the best ferret food for them. 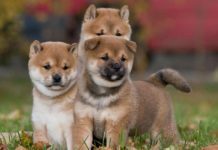 They have a high metabolic rate, meaning they need to eat more often throughout the day. When it comes to frequency of meals for a ferret vs cat, a cat would eat 2 to 3 meals a day, whereas a ferret eats 8 to 10 smaller meals. Their meals should be high in protein, high in fat, and be made with chicken or lamb. Whenever buying ferret food, check the ingredients list and make sure the meat source is listed as the first or second ingredient. Aside from protein, your ferret needs to get enough fatty acids, which is why it’s a very common supplement for the animal. So, can ferrets eat cat food? The answer to that question is yes, they can. But not all types of cat food are suitable for a ferret. If for some reason, you can’t find ferret food at the pet store or at the veterinarian’s office, some kitten foods are just as good, provided you also supplement with a fatty acid. Most cat and kitten foods contain a lot of grains, like rice. Ferrets don’t need grains, and in fact, it can be harmful – especially if it’s one of the main ingredients of the food they’re eating. If a ferret is eating food with insufficient amounts of protein and fatty acids, he can suffer from malnutrition, dull coats, and other health problems. The main thing to note is that you need to be very picky when choosing cat food for your ferret. A diet based solely on cat food may lead to improper nutrition over time. When choosing a cat food for your ferret, make sure it doesn’t contain any grains and has a high quantity of protein. Kitten food is made with higher percentages of protein to help their growth, which is why it’s better suited for ferrets than adult cat food. When picking your ferret’s food, check the ingredient list to ensure it has all of the nutrients your pet needs. Protein should be the first or second ingredient, and there should be no grains or artificial preservatives. Something to note is that ferrets also eat more than cats, due to their fast metabolism and short digestive tracts. One study found that a ferret ate double that of a cat. Keep in mind that a ferret’s food needs to be made up of at least 30% protein and 15% fat. 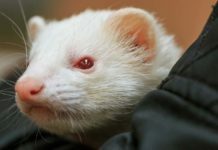 Ferrets who don’t receive enough of these nutrients may suffer from poor reproductive performance and frequent illness. Can Ferrets Eat Wet Cat Food? This is another common question, and the answer is tricky. Ferrets can eat wet cat food, but it’s not recommended for a few reasons. For starters, wet cat food typically does not contain enough caloric density for a ferret. Ferrets require high fat, high protein diets. They would need to eat a lot of wet food to meet their nutritional needs. Canned cat food is also not crunchy enough for a ferret. When your ferrets eat their pellets, it not only provides them with nutrition, but it helps remove plaque off of their teeth. If a ferret were to eat only wet food, he would experience plaque build-up. Can Ferrets Eat Cat Treats? Even though ferrets and cats are both carnivores, they have different nutritional needs. When it comes to treats, you need to exercise restraint. You can feed your ferret cat treats, but not often. Poor quality cat treats are often made with low amounts of protein and fat, the primary ingredients that make up a ferret’s diet. Not only that, but they often have rice and corn in them, which are things you don’t want your ferret to eat. Your ferret may not want to eat a poor-quality treat at all, as she will be able to tell there is a low amount of animal protein. If you are going to feed your ferret cat treats, check the ingredients. Make sure there is enough protein, fat, and a low amount of fiber. And most importantly, there should be no grains on the ingredients list at all. 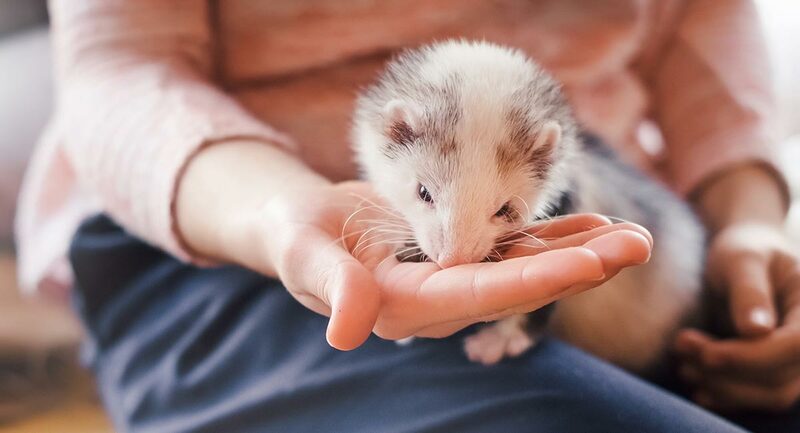 Aside from cat treats, other healthier treats for your ferret include meat, eggs, raw fruit or vegetables (less than a tsp a day), or semi-moist liver or meat snacks. Make sure any prepackaged treats are low in carbohydrates. Don’t overfeed your ferret with treats. So, the answer to the question, “Can ferrets eat cat food?” is yes. If you carefully check the ingredients list and ensure all nutritional needs are met, cat food is just fine. Of course, if you can get your hands on real ferret food, that is always the better choice. Avoid grains and high carbohydrate food and treats, and your ferret will live a long and healthy life. Bell, J. A. (1999). Ferret nutrition. Veterinary Clinics of North America: Exotic Animal Practice, 2(1). Sá, F. C. et al (2014). Comparison of the digestive efficiency of extruded diets fed to ferrets, dogs, and cats. Journal of Nutritional Science, 3(e32).